Bottle gourd/ Dudhi/Lauki/Lau is one of those mild tasting vegetables which doesn't feature in our favorite vegetables list. But we love it as a dessert, Dudhi ka halwa which is a thick fudge made by simmering grated bottle gourd in milk and sweetening it with sugar and dry fruits. I have been consciously working towards introducing it as a savory vegetable to my family. The other day I made Lauki dal wherein I boiled bottle gourd with yellow moong dal and tempered it with an onions tomato and spices. This was devoured with white rice. Bottle gourd is made up of 96% water content making it a preferred choice during summer. It is considered to be beneficial for health especially for diabetic patients. Its a low calorie, high fiber vegetable rich in vitamin C and antioxidants. Bottle gourd has a mild flavor of its own but has a tendency to absorb whatever flavors you add into it. Bengali cuisine has many unusual recipes created with this beautiful vegetable. Lau Ghonto is one such recipe wherein the mild sweetness is further enhanced by adding milk and little sugar and flavoring it with just kalonji(black onion seeds). Recipe coming soon! 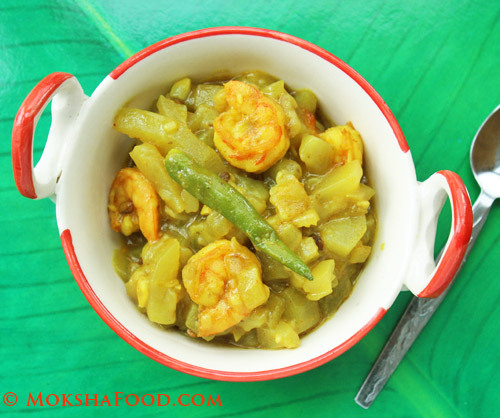 Today my mother in law introduced me to this amazing recipe called Lau Chingri which has bottle gourd cooked along with shrimps/prawns. This is one of their specialties and is usually made while entertaining guest or just when cravings hit. Its an easy, semi dry preparation served along with rice and dal. The flavors were awesome. 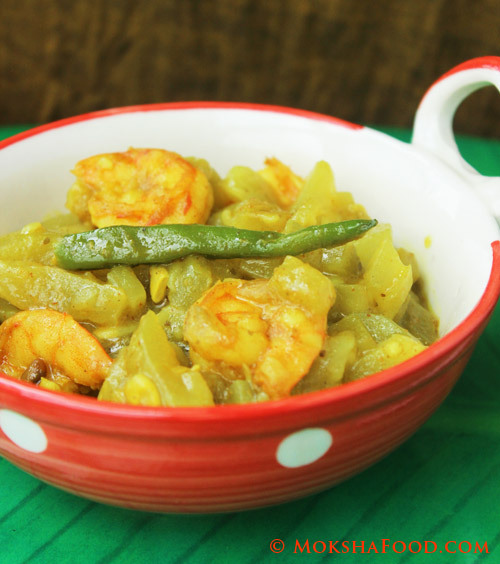 For people who don't enjoy bottle gourd, they should definitely give this recipe a try. I promise you wont be disappointed. Clean and remove the shells of the shrimps. Marinate with 1/2 teaspoon turmeric powder and some salt and keep aside for 10-15 minutes. Heat some oil in a saucepan to medium. Add the shrimps and saute till the shrimps are almost done. Remove with slotted spoon and reserve. In the same saucepan, add some mustard oil and heat it further. Temper with fenugreek seeds and saute till get slightly brown and a lovely aroma emanates. Don't let them blacken. Add the chopped bottle gourd and little salt and mix well. Cover and cook till the bottle gourd is almost done. Add the spice powders- remaining turmeric, red chili, cumin and coriander powder. Add the sauteed shrimps and mix well. Now add the green chilies and cover and cook for 5 more minutes. Add some rice flour to thicken the sauce and cook for additional few minutes. Serve hot with white rice and dal for a delicious meal. Try to get your hand on the smallest shrimps you can find. It just tastes better with that. I have used medium size as I couldn't find them.